There are ordinary, garden-variety corrections that occur from time to time. And then there are the sort of amazing washouts like we saw the first week of August 2011 that are in a different class. This week's chart shows the extreme nature of the washout of selling pressure which occurred. The drop on August 4 saw 96 out of 100 stocks in the Nasdaq 100 Index reach new 10-day closing lows. That is the highest ever total for one day in at least the last 18 years. Normally, new highs and new lows are measured with a 52-week lookback period. And that can lead to some very powerful tools. Switching to just a 10-day lookback period for examining these stocks' price movements is actually an adaptation of work done many years ago by the late Richard Donchian. Donchian was a pioneering trader of commodities futures who died in 1993. One of the techniques he established is now known as Donchian Channels. It involves plotting on a price chart the highest and lowest price points seen during the last X number of days, and a 10-day or 20-day lookback is a typical parameter. These form a type of trading bands around prices, much like the way that the more modern Bollinger Bands are used by many people today. 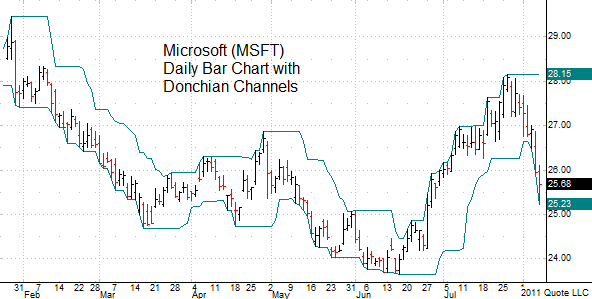 A "Donchian breakout" occurs when the prices goes above or below the Donchian Channel lines. Price breakouts was the main principle used by the Turtle Traders in the 1980s. So when we look at this week's chart of the number of new 10-day lows among NDX stocks, what we are really looking at is how many of those stocks are on bearish Donchian Channel breakout moves. The same can be done for 10-day new highs as well. Ordinarily, it is considered a bearish event for an individual stock to break below its lower Donchian Channel line. But when we see large numbers of stocks all doing that at the exact same time, then the meaning changes. Readings above 60 tend to mark important short term price bottoms. So getting this indicator all the way up to 96 shows that a concerted and exhaustive selling wave has taken place.